On Friday, March 18th, @aircalgary, a member of the Patients 4 Change (Pts4Chg) community, set out for Medicine Hat, Alberta. It was there that the next Family Presence chat session was taking place. Below is @aircalgary’s overview of the day. The Canadian Mental Health Association’s cozy meeting room in Medicine Hat was the location of my second Family Presence coffee chat from 1 pm to 3 pm. Organized with the help of Lorna Scott, a local author, caregiver coach and trainer, Lorna brought together members of the Caregiver Coalition of Southeast Alberta for our chat on the Family Presence campaign in advance of April 4th Change Day here in Alberta. I brought the swag, cookies and balloons and Family Presence conversation cards. To learn more about this group that has been connecting caregivers in SE Alberta since 2009 see: https://www.facebook.com/CaregiverCoalitionOfSoutheastAlberta/. Seems to be in popular use as well. C. The challenge of ensuring presence when their status as care partners supporting vulnerable citizens, via a paid role with a not-for-profit agencies, is often completely overlooked by healthcare facility staff. Mentioned frequently was the theme of a lack of communication regarding admissions, discharge planning, specialists’ follow up care, even when the care partner is formally listed as the patient or senior’s primary emergency contact. Care partners and patients are left feeling invisible and abandoned. A worrying comment was about rural family caregivers, who’s loved one has received care from a metro location, but doesn’t know how, or that they can ask for follow-up help when they are back home. D. The enormous financial challenges that care partners of patients with cancer or other life-limiting illnesses or sudden disability, experience. Often it is not just the practicalities of surviving the illness (loss of income, learning about insurance and medication plans, etc.) but also the agonizing costs of trying to ‘fit a lifetime of dreams’ into the time that might be left, and family and care partners guilt at not being able to say no, despite real and impending possibilities of poverty that could result. E. There was a wonderful reflection on how to support care partners through challenging illnesses when that additional stress of being in presence of illness/disability can uncover unresolved issues in a family or in other relationships the patient’s or their care partner has. Some care partners react by over-compensating, “doing it all” and getting exhausted. Just as challenging was how to support those individuals who may ‘under-react’, just avoiding the situation altogether. So this is situation where a healthcare provider might see the care ‘partner’ sitting in the waiting room, (or family is dropping patient at the door for their appointment) missing a potentially important experience to connect in as a part of the patient’s health team. How to move ‘family presence along’ when no one is talking at all? The Caregiver Coalition members described the delicate bridging roles they have when exploring these emotional conversations with individuals and couples. F. There was a great discussion as well about some of the techniques to inform healthcare team members about the particular lived experiences of less commonly understood conditions like Parkinson Disease or spinal cord injuries. One initiative from the Parkinson’s Society called Aware in Care is a shaving kit filled with items to help healthcare team members be more aware of specific care needs of these patients. The intent is to help and thank healthcare team members who might not be aware of how to care for someone with this disease: I wondered if this helps create some emotional respite for care partners, who, (perhaps?) don’t have to be quite as hyper-vigilant when their loved one is hospitalized. To learn more about Aware in Care see: http://www.parkinsonalberta.ca/aware-in-care-kit-contents. G. The meeting was best summed up with the recognition that healthcare staff are so pressured to deliver care in certain ways that patients feel reduced to being ‘a form’ to get completed. One member asked if an ‘I refuse” check box choice on forms could be included for when a patient or family does not feel listened to. Agreement by all that we have to talk about empowering each other to be experts in our own care and that will help to empower us to be more effective as care partners. The time together with the Caregiver Coalition members flew by. I was extremely grateful that everyone pledged. I’ll admit that it was a bit scary to walk into someone else’s city where they are experts and to ask them to join something new. I am so appreciative that it went well. One person even said that they’ll bring Change Day Alberta and Family Presence as the topic for conversation at their next healthcare community of practice meeting. Yahoo! 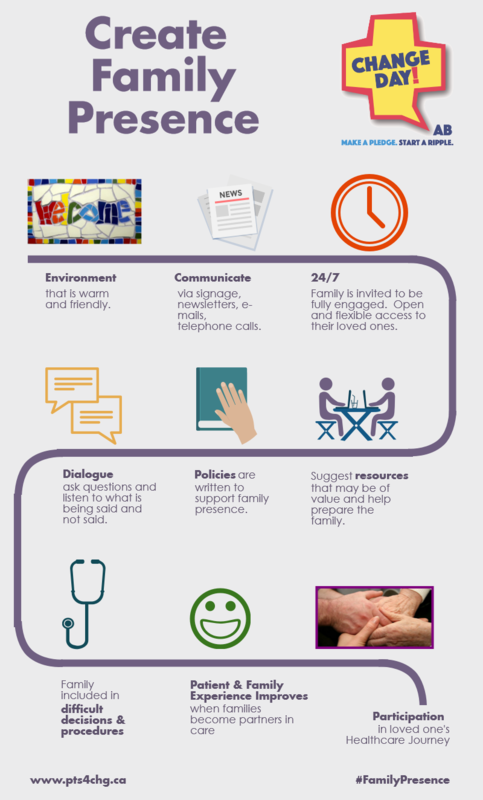 I am excited that there is such support building to have care partners lead formal and informal Family Presence conversations across Alberta. Imagine, citizens collaborating for health for building a case for creating citizen focussed materials to accompany CFHI’s staff and physician focussed Better Together materials. All of you Change Day Alberta rebels! This entry was posted in Event, Family Presence, News and tagged ChangeDayAB, family presence. Bookmark the permalink. ← We Know the Senior Population, Right? Want to come to Lethbridge?